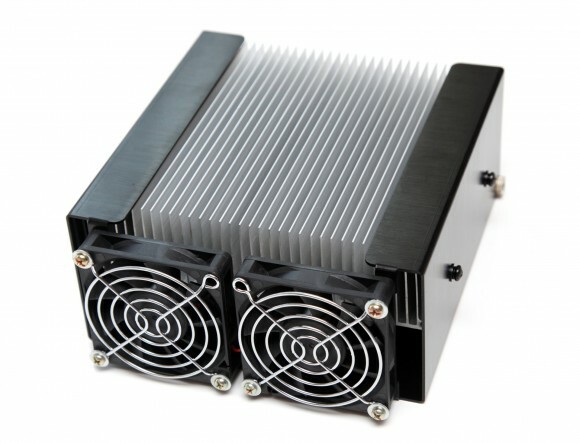 ZeusMiner Blizzard X6 is the smallest of all new lower power usage Scrypt ASIC miners from Zeus, it is the successor of the previous Blizzard units, but unlike the bigger models this one actually has more chips running at lower frequency. The end result is higher hashrate of the new unit as compared to the performance of the older miner that also comes with higher power consumption. 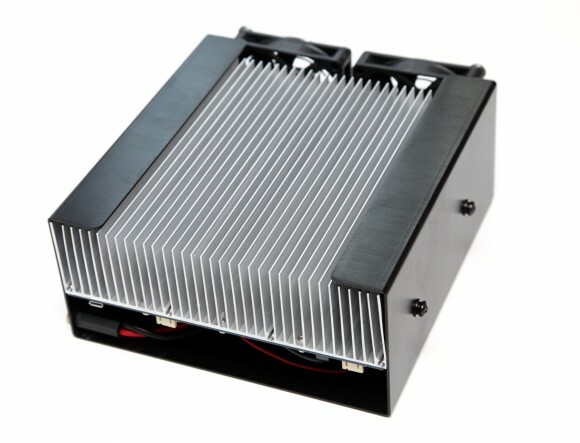 The old Blizzard units offered 1.3-1.4 MHS with 6 chips at about 50 Watts of power usage, the new Blizzard X6 uses 24 chips at lower operating voltage and frequency and should provide 4 MHS at 100W. This means almost three times the hashrate with just two times the power usage, so it does not sound like a bad improvement. It is interesting to note that the Blizzard X6 was initially announced at 3.6 MHS and now the official specifications state 4 MHS. Unlike with the older Blizzard that included a PSU and USB cable in the package, the new ZeusMiner Blizzard X6 does not include these anymore. We have received our unit with just the miner, no micro-USB cable in the package or a power adapter, not even a 4-pin Molex or 6-pin PCI-E adapter for powering the device with an ATX power supply. 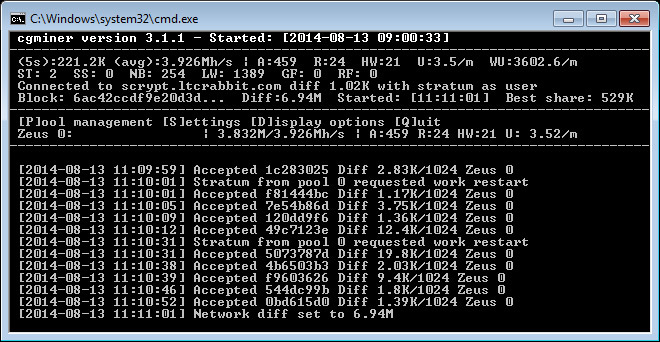 This left us a bit disappointed, but was probably done to save costs and make the price of the miner lower. We could’ve gone easily without a PSU, but the USB cable and a connector for a computer PSU is something that must be in the package as not everyone will have these already available like we do. The Blizzard X6 cooling design is not perfect, but apparently it works pretty well delivering enough cooling performance with not so loud level of noise. We have measured the power usage of the new miner to be about 106W with the device running at 235 MHz at the wall and the level of noise from the cooling fans was at just about 45 dBA. Looking at the board with the chips we have noticed that the Blizzard X6 also uses 1.1V voltage and the maximum recommended operating frequency is 248 MHz, though you probably would want to use a lower number to get less HW errors. Here are two thermal images showing the operating temperature of the ZeusMiner Blizzard X6 during normal operation. The temperatures of the aluminum cooler used to cool the chips is just about 36 degrees at the hottest place, in fact the highest temperature we’ve measured was at the power connector of the device. Initially we’ve powered the miner from a 4-pin molex connector, but that got the cables too hot, so we’ve changed the power source to use a 6-pin PCI-E power connector as an input. So be extra careful what source of power you are going to use as a single 4-pin molex connector might not be able to handle well the ~100W load, preferably use dual molex connectors or a PCI-E one. We have tested running the ZeusMiner Blizzard X6 at different frequencies and the one that seemed to provide the best results with our unit was 235 MHz, though you may have varying success with lower or higher frequencies, so we do recommend to try going up to about 250 MHz. At 235 MHz operating frequency the Blizzard X6 was able to provide about 3.8-3.9 MHS with about 4.5% of HW errors. 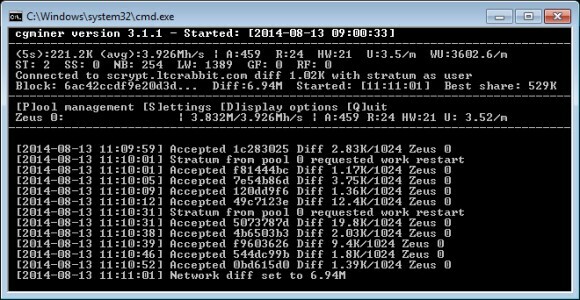 We already know that the Zeus Scrypt ASIC miners do actually have higher number of HW errors compared to most other ASIC miners, however we do not like to push our hardware too much and get like 10% of HW errors – something that is easily achievable if you try to push the new X6 miners to about 250 MHz. A look at the average poolside reported hashrate from the LTC Rabbit Scrypt mining pool using the new fixed difficulty port with 1024 difficulty for Scrypt ASIC miners and the Blizzard X6 running at 235 MHz operating frequency. We’ve seen that the actual pool hashrate has varied between 3686 and 4164 MHS for a 24 hour period of time, but the average should be about the advertised 4 MHS rate. The ZeusMiner Blizzard X6 Scrypt ASIC miner is not the best choice for investment, especially now with the current low LTC price, at least not for people interested mostly in the fast ROI. In fact the Blizzard X6 is intended for the people that are mining as a hobby or just for fun, it is also a good way to get some experience with Scrypt ASIC mining, if it is something new for you, without having to invest too much into hardware and only focus on the profit. The Blizzard X6 is also a great choice for the modding community, just like the previous version of Blizzard – doing experiments with overvolting and modifying the cooling solution. It is a fun little and affordable Scrypt miner to play with and experiment with, but not something that will get you quick return of investment or even make you profit. So think carefully what you are getting this miner for and should you really invest some cash into it or not, though the same applies for the larger ZeusMiner Scrypt ASICs as well with the current market situation.